Megapro® Drivers are an innovative, high-quality line of screwdrivers that feature a clever built-in storage system. Every driver comes with a set of bits that are actually stored inside the driver’s handle so that you’ll never have to lose another bit! The variety of bits supplied allows you to save space in your toolbox by essentially combining several driver types into one. And these drivers are built to last! Equiparts carries a variety of Megapro® Drivers for both general and specialty use. There are several features that all Megapro® Drivers have in common. The shaft of each driver can be used as a 1/4″ Hex Nut Driver. They also all have a patented Palm Saver Cap™, which does not turn as the users turns the driver. Another feature these drivers (except the Ratcheting Driver) share is the patented EZ Guide Collar™, which provides the user with better control and maintains consistent contact between the driver bit and the screw. This allows the screw to be driven with much more ease. The drivers each have a retractable bit cartridge located at the top of the driver. This allows for easy storage and organization of bits, making any job that much easier. What makes each driver different? This is the most popular of the Megapro drivers. It features fourteen of the most common bits for driving screws. The shaft can be used as a 1/4″ Hex Nut Driver, making it 15-in-1. Each of the seven bits included are double-ended professional quality bits. The bits included with The Original are: Phillips Bits 0, 1, 2, and 3, Square Bits 0, 1, 2, and 3, Slotted (Flat) Bit 4 and 6, and Torx Bits 10, 15, 20, and 25. Megapro model number 151NAS. This driver is a must have for tradesmen in commercial and industrial fields. It is ideal for locksmiths, electricians, and any maintenance personnel. The driver comes with fourteen double-ended security bits, including Spanners 6, 8, 10, and 12, Hex Pins 1/8, 9/64, 5/32, and 3/16, Torx Pin Bits 10, 15, 20, 25, 27 and 30. The Megapro model number is 151TP. The ShaftLOK driver features an innovative grooved bit design which prevents the bits from falling out of the driver. No more lost bits when they get stuck in the fastener. The driver includes fourteen double-ended bits. The bits included with the ShaftLOK are: Phillips Bits 0, 1, 2, and 3, Square Bits 0, 1, 2, and 3, Slotted (Flat) Bits 4 and 6, and Torx Bits 10, 15, 20, and 25. Megapro model number 151SL44. The Ratcheting screwdriver features patent pending ZAD 8 Zinc Alloy SOLID-CORE ratchet which delivers over 225 inch pounds of torque strength. Driving fasteners is easier and faster with the Precision 28 tooth ratchet design and rubberized cushion grip handle. The driver comes with six double-ended professional quality bits. The bits included are: Phillips Bits 0, 1, 2, and 3, Square Bits 1 and 2, Slotted (Flat) Bits 4 and 6, and Torx Bits 10, 15, 20, and 25. Megapro model number 211R2C36RD. This screwdriver is a must-have for any HVAC technician. It is a high quality tool that also saves space. This driver features 6 double-ended bits which include:Phillips Bits 0, 1, 2, and 3, Phillips DoubleLok Bit 2, Slotted (Flat) Bits 3, 4, 5, and 6, as well as 5.5 and valve stem bits. The driver also comes with a Square Awl Reamer bit which is great for piercing through sheet metal. Megapro model number 141HVAC-U. This driver is specifically for rugged outdoor use. It can be used on ATVs, snowmobiles, and more! The handle is made with a multi-resin molding process which makes it nearly indestructible and great for outdoor use. The driver is great for in the field situations like emergency repairs or maintenance. Included with the driver are six double ended bits plus a round awl to undo soaked or over tightened rope knots. Just like the drivers listed above, the shaft of this driver can be used as a 1/4″ Hex Driver. The bits included with this rugged driver are: Phillips Bits 0, 1, 2, and 3, Square Bits 1 and 2, Torx Bits 10, 15, 20, and 25, and Flat Bits 4 and 6. Megapro model 151OUTDOOR. This compact, high-intensity LED work light produces a powerful floodlight to make your everything in your work space easier to see. The housing of the work light is rugged and water resistant, which makes it last longer. It has a quality on and off push button, and a molded clip allows the work light to be secured in your pocket. This work light also has a magnetic swivel base, allowing it to cling to metal surfaces, and turn in any direction. It uses three AAA batteries to power the six super-bright light emitting diodes. Megapro model #6WORKLIGHT. These locking extensions are great for getting into those hard to reach places. The 6 inch and 10 inch extensions both lock into the ShaftLOK screwdriver shaft with a 0.375 inch minimum clearance. For getting into those extremely hard to reach places, you can link multiple extensions together for a longer reach. Megapro model 6EXT-SL6-C for the 6 inch Extension and 6EXT-SL10-C for the 10 inch extension. Listed below are a collection of unique drivers that are specialized for different situations or professions. If you would like to order any of these drivers or any other that Megapro carries, please give us a call at 800-442-6622 M-F 730AM-5PM. This 13-in-1 ratcheting screwdriver is a must-have for professional auto mechanics, or anyone who regularly works on cars. The magnetic shaft is constructed from 303 stainless steel. The 28-tooth ratchet design allows you to drive with speed and ease. The handle has a rubberized cushion grip for comfort. Like the drivers above, the shaft can be used as a 1/4″ Hex Driver. The driver includes 12 one-inch bits made of S2 industrial grade steel which are ideal for use on automotive screws.The bits included with this driver are: Phillips Bits 1, 2, and 3, Square Bit 2, Slotted (Flat) Bits 4 and 6, and Torx Bits 10, 15, 20, 25, 27, and 30. Megapro model 211R1C36RD. This unique screwdriver is built specifically for service technicians in the electronics field. It comes with seven double ended professional bits, making it fourteen bits in total! The shaft of the driver can be used as a 1/4″ Hex Driver. The bits included with this driver are: Square Bits 1 and 2, Torx Pin Bits 10 and 15, Spanner Bits 6, 8, 10, and 12, Phillips Bits 0, 1, 2, and 3, and Slotted (Flat) Bits 4 and 6. Megapro model 151ELEC. This screwdriver is designed exclusively for elevator service technicians. The bit cartridge contains a mix of tamperproof and standard bits. The handle is specially made to be durable and drop resistant. The seven double-ended professional bits included with this driver are: Torx Pin Bits 10, 15, 20, and 25, Spanner Bits 6, 8, 10, 12, Phillips Bits 0, 1, 2, and 3, and Flat Bits 4 and 6. The shaft of this driver, like the others listed above, can also be used as a 1/4″ Hex Driver. Megapro model 151ELEV. This driver is designed for use while on the job. It has a yellow handle which helps it to stick out in a toolbox or on a tool belt. This 15 in 1 driver includes the following bits: Phillips Bits 0, 1, 2, and 3, Hex Bits 1/8, 9/64, 5/32, and 3/16, Torx Bits 10, 15, 20, and 25, and Flat Bits 4 and 6. When there is no bit in the shaft, the shaft itself can be used as a 1/4″ Hex Driver. The combination of different bits included with this driver gives it the ability to fix pneumatic power tools while on the job. Megapro model 151JOBSITE. 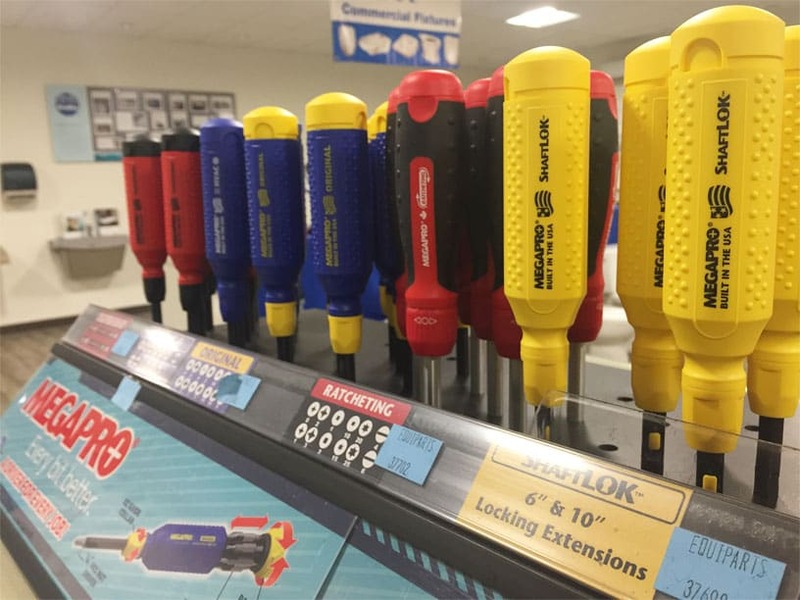 Megapro officially started in 1994, driven by inventor Hermann Fruhm’s concept of creating a better storage solution for screwdriver bits by placing them inside the driver handle. This was an innovative idea, and would help solve the problem of missing bits while on the job. After numerous prototypes and sketches, the first Megapro screwdriver was created in the early 1990s. Its patented features quickly gained market success, and many users saw and appreciated the quality of the screwdriver as well as how easy it was to use. There are over twenty different variations of the screwdriver, each one designed specifically for a different type of job. Today, Megapro continues to grow domestically, and their international reach is also expanding.